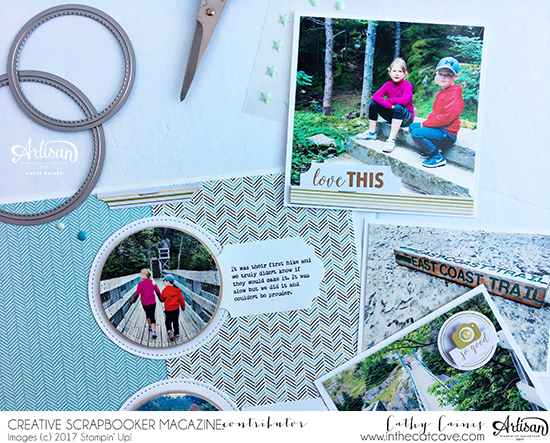 Simple scrapbooking tips and tricks featuring Stampin' Up! I’ve been trying to get through my pictures and as a result my layouts are becoming more clean, simple and less time consuming. There’s very little time between meal times, soccer practices and school so I am learning very quickly not to agonize over the little details. In fact, it’s fair to say that my scrapbooking style is slowly evolving into cleaner more simple style. This layout is no different; however, I had multiple photos I wanted to include from this beautiful hiking adventure we took on the East Coast Trail in Newfoundland, Canada. The only way I know how to solve that problem is to mix a traditional layout and pocket page layout. After selecting my photos, I realized that I didn’t need the full pocket page spread so I split it in half using my scissors. Starting with a 8.5 x 11” white piece of cardstock I began to shuffle through my patterned paper and fell across the Stampin’ Up! Coffee Break Designer Series Paper. The colour scheme matched perfectly but I couldn’t decide what piece to use. I laid them side by side and slid my photos over top. And that’s how the two toned background piece was selected. I simply didn’t have to choose one or the other – I could use both. I had it in my head that I wanted to use the Stampin’ Up! Stitched Shapes Framelit Dies in order to capture three photos in a circle shape. The dies come in a set so I knew it would be easy to select a size and then use the smaller size for the photo. The details on the stitched die shapes are amazing so nothing more is need there.To complete my layout, I used the Stampin’ Up! Everyday Label Punch in order to punch out my journaling after I typed it up and ran it through my printer. With a couple enamel dots in the opposite corners, I called these layouts done. Clean and simple. Thanks for dropping by – I’d love to know if your style is beoming more clean and simple as your calendar gets fuller and fuller. If you are interested in Stampin’ Up! and are living in Canada and don’t have a demonstrator, I’d love help you out. Feel free to drop me a line to get a catalogue or if you have any questions/comments you can always find me at inthecatcave@hotmail.com. Cathy Cainespage pocket scrapbookingProject LifeStampin' Up!